Community traffic may differ from highway traffic, but you need to be ready for dealing with both as you travel in Mexico. You also need to have a basic understanding of road signs so that you understand cautions, speed limits, and other driving issues. Select the best Mexican car insurance online to be sure that you are prepared in case of emergencies. Your Mexico insurance quote only takes a few minutes to obtain. As you drive through a state like Baja Norte, there can be long stretches of lonely road, but your encounters with signs will be comparable to those you might experience at home. The main differences will be terminology being Spanish and measurements being metric. A speed limit sign looks like those back home, but the velocity will be given in kilometers per hour. If your odometer is configured to provide dual readings in both English and metric units, you don’t have to worry much. If you lack metric markings in your vehicle, just remember that a kilometer is approximately two-thirds of a mile. You can divide the marked velocity by three and double that amount for an estimate of the miles per hour for the best idea of the comparable speed limit in familiar terms. Although your instinct may guide you in terms of how fast to travel, you need to be cautious of encounters with officials. Some think that the best way to avoid a ticket is bribery, but this can backfire. It is better to avoid such encounters on highways and in a community by driving within the defined speed limits. Further understanding of highway signs is guided most commonly by international symbols and colors. As you drive in a community, look for arrows, images, and other clues to information. Understand the idea of a cognate, a guide to deciphering many Spanish words that sound similar to English words. Your Mexican car insurance online for vacation has a tourist assistance line that can be helpful if you break down, and signs may provide clues as you discuss your need for help with a representative. Look for such assistance features when you get a Mexico insurance quote. Your Mexican car insurance online should also include legal assistance among its benefits. Passengers can be allowed to drink alcohol, but car drivers aren’t, especially when driving their vehicle on public roads. Additionally, getting themselves familiar with highway signs is important. 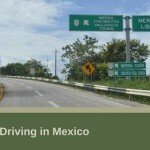 Mexico insurance excludes drunk driving. At least the signage of the roads Mexico look similar to the ones back home so that should not give me a lot of trouble identifying them while driving. I will still need Mexico auto insurance since they are best rated in the industry and I need the cover while driving on Mexican highways. Passengers are allowed to drink alcohol. But the driver is prohibited from doing it because he’ll be driving a car along on the public roads. For peace of mind, it is always advised to carry with you your Mexico insurance.